AKG K545 review | What Hi-Fi? The K545s are a development of AKG’s five-star K551 over-ear headphones, but are smaller and more manageable than their predecessors, and so a more suitable choice for the great outdoors. The K545s are smaller in size and lighter than the K551s: lie them side-by-side and you can really see the difference. For many, this smaller form factor is going to be a pretty significant draw. Although the form factor may have shrunk, the AKGs still manage to leave enough room for the same 50mm driver, which, on paper at least, bodes well for sound quality. The AKGs feel like they’ve been made with the hustle and bustle of daily use in mind. There’s a reassuring solidity to the earpieces and although the metal band is flexible, you’d have to be pretty determined to bend it out of shape. The padding underneath the band helps these ’phones sit comfortably on your head, as do the earpads – they can be tilted to fit the angle of your ears. Our ears felt a little warm over prolonged use, but not uncomfortably so. The pads also rotate 90 degrees so you can store them flat. There’s no protective pouch or case supplied in the box, which is a shame. Helpfully, the K545s come with two choices of headphone cable. One features a three-button inline control and mic for iOS users. The other uses a single-button control and mic for Android and Windows followers. Both sound clear and audible, coping well with outside noise. We did, however, find ourselves preferring the iOS-compatible cable – in our opinion, it adds a little more weight to lows and encourages a more refined and full-bodied sound. The other cable seems to incite some roughness around the edges. 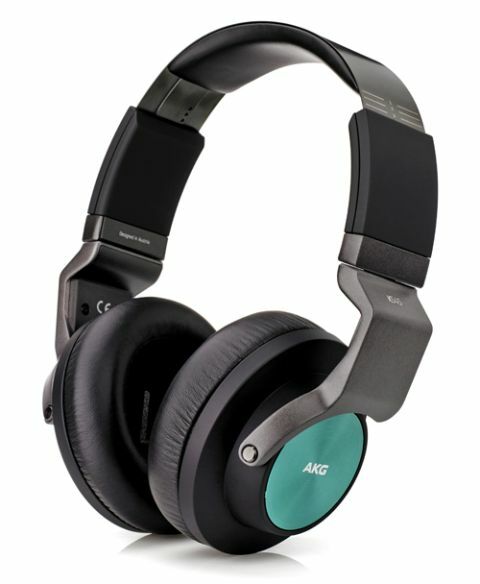 Given they’re a closed-back design, the AKGs make a decent stab at sounding open and clear. You can enjoy a lot of detail across the board and the headphones display a good sense of timing and rhythmic ability. They’re very analytical, which will expose poorer-quality tracks – rivals such as the Sennheiser Momentums sound smoother and richer. Listening to Lady Gaga’s Do What You Want and the K545s sound punchy and get straight to the point. Vocals from Gaga and R Kelly (remember him?) are forthcoming, full of power and expression. But they also sound a little congested and don’t quite exude the finesse and subtlety of a pair of Momentums. There isn’t an ounce of fat where bass is concerned. The AKGs stamp the leading edge and outline of the notes, but in our opinion music could do with more weight and an injection of richness. The normally thick, meaty lows of Naughty Boy’s One Way don’t sound particularly full-bodied. Compared with the larger K551s, these cans sound brighter and harder, making them less enjoyable in the long term. B&W’s P5s or the aforementioned Sennheiser Momentums are a better option if you’re looking for finesse and refinement. We love the compact nature of these new AKGs and their stylish, solid build will go a long way to convincing potential owners as will their detailed and punchy sound. But, their character isn’t without fault and we’re a little disappointed they’re not as talented or as likeable as we had hoped.